Another Local Journeys project (see previous posts on World of Small and Kite making at Brean), this one was commissioned through the English Heritage Schools initiative to work with Year 3 and 4 children at Frome Vale Academy in March 2013 as part of their Community History project to investigate their neighbouring post-war housing estate – home for many of the school’s pupils so the emphasis of the project was on ‘knowing your place’. I’ve already written an overall description of this project for the Local Journeys’ website so this post is more about some of the behind-the-scenes activity that went into the project. 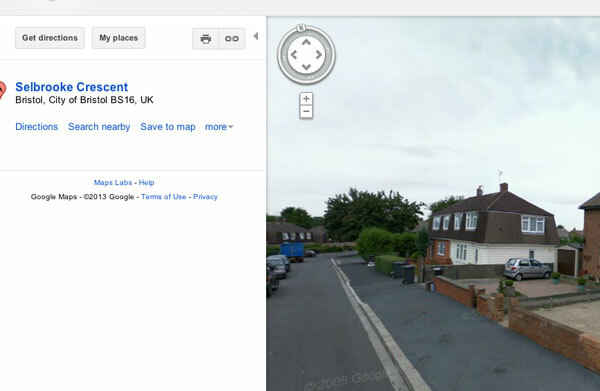 Planning the routes with the help of Google Street View. Organising the route around the estate for 3 classes to visit on different half-days that would allow each group to experience a good range of different details, required some careful planning. I’d visited the estate 2 or 3 times before the project to take some reference photos and assess distances and timings for the children to walk but still needed to fine tune the journeys. 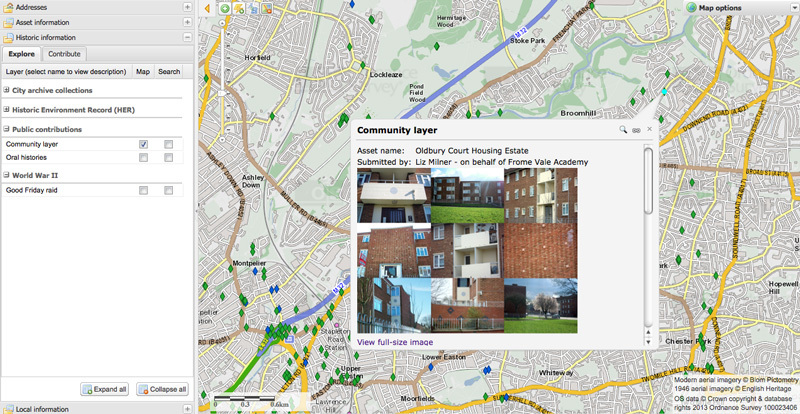 The Housing estate is a 22 mile round trip from my home so with no travel budget minimising further visits was important – the solution was to use Google Street View. It was an invaluable tool for reminding me where I’d seen a house with distinctive post-war wall cladding, or an odd garage, curious hedge or characteristic 1950s porch design, and more prosaically to check safe places for crossing roads. 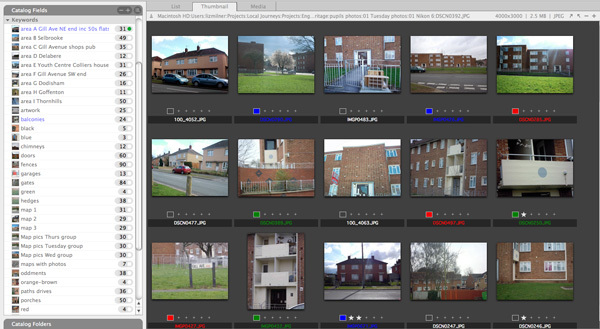 This not only saved petrol costs and time but also allowed me to linger in front of houses, blocks of flats or sheds to take in the detail in a way that could look like questionable behaviour to local residents if done in person with a camera in hand! Not so bad if you’re trailing 30 children around as it’s clearly a school project. A journey back in time in the classroom using Know Your Place and other maps helped us to discover how the land that is now beneath the houses has been used for the last 1,000 years. 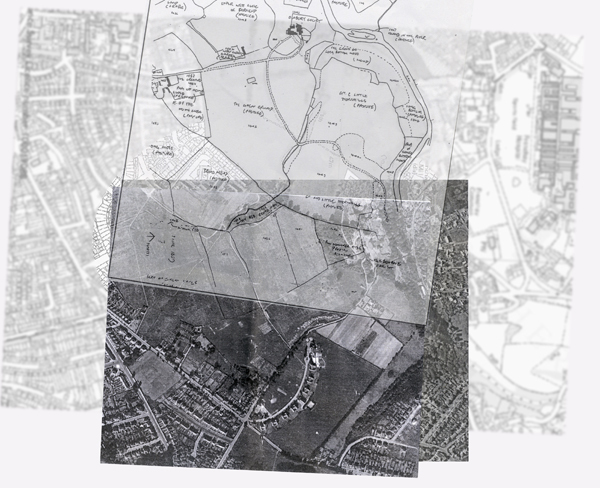 Once part of the royal hunting forest of Kingswood, it later became farmland owned by the Oldbury Court Estate, then market gardens before the housing estate was built in the 1950s to alleviate housing shortages in Bristol caused by both WW2 bomb damage and sub-standard housing. These were topics the children had covered already in school, and they’d also learned a little about planning through a session with the Architecture Centre. So, before we even left the classroom they were already aware that it’s people that shape places. We then took the children out to the estate with cameras, with three classes each making one visit on consecutive half-days – some in numbing wind and horizontal snow – to different areas within its boundaries. We’d discovered that some of the old field names could still be found in the names the estate roads had been given (eg Thornhills was once a pasture field) so as we walked around the roads on the estate – which in some cases followed old field boundaries – they were asked to think about being in two time zones simultaneously; first as C19th dairymaids or cowherds on their way to a long, hard day’s work passing the hedges surrounding the fields, but also as present day observers of the place as it is now. 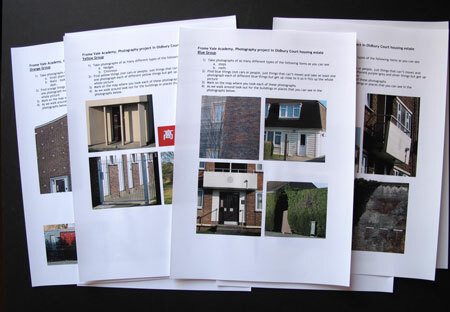 After I’d scrutinised the estate in both the real world and online for features of note I devised a list of themes for the children to look out for and using some of the reference photos I’d taken, along with a street map of the estate, I prepared some ‘clue sheets’ for each group of 3 children. Taking turns to do each task they’d look for the buildings or architectural detail in the picture clues and help each other find the themed subjects to photograph. They had to look hard to see the differences in surface detail of walls, fences and paths; the range of building types or the variety of doors, windows and gates, and to note how the ‘field boundaries’ looked now – still some hedges though traditional hedging plants like hawthorn are now more often non-native golden cypress, but still providing homes for sparrows. Finally they marked on the map where they’d taken a photo. I was aware there wouldn’t be time to do an initial edit on the cameras with the children (the usual procedure I follow) but for the follow-up visit the next week I’d planned for each class to work with the photos they’d taken although we’d only have an hour for each session. So, the next vital stage was sorting the photographs. All the photographs were uploaded into an image cataloging programme that included information about the date of each class’s visit and each groups’ camera details. Using the ratings, labels and keywords feature of the programme I sorted the photographs into the themes the pupils had been allocated as well as grouping them into different geographical areas for the Know Your Place website and making selections for adding to the Local Journeys’ Flickr page. 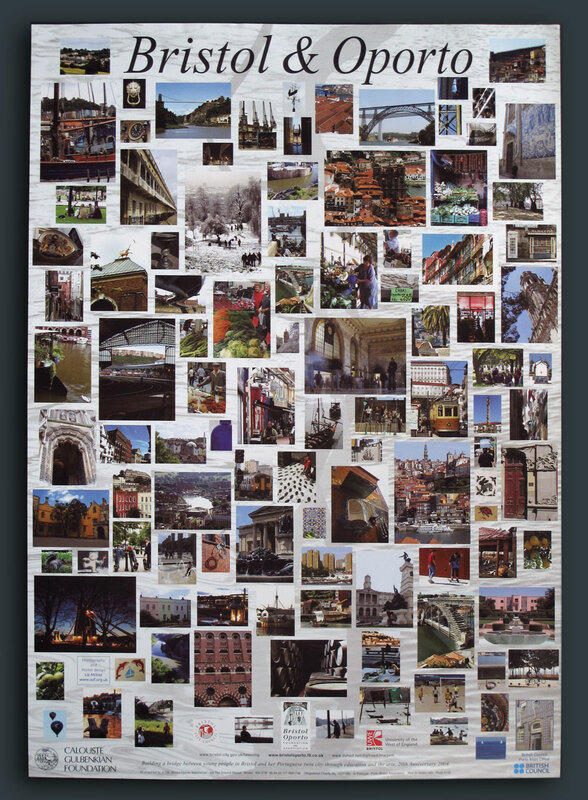 I’m not clear how else this categorising and ordering could have been achieved but the 60 + children had taken over 1200 photographs and it took a long time. A very long time! However it’s also an oddly satisfying process and produced the options I needed for providing sets of appropriately themed images for the second and final workshop visit. The following week I took in carefully organised and labelled sets of thumbnail prints so the children could work with their own images; they’d clearly engaged with their tasks and produced a detailed record of the areas they’d visited that included a high proportion of excellent photographs. At the start of these final sessions I’d shown each class some examples of the montage posters I’d made about different places (see here and here for examples) and the children created their own quick versions about the estate using the thumbnail photos and the themes they’d been given that helped them see the wide variety of subject matter they’d observed. They also referred to the maps they’d marked up when they were out taking the photos then identified those locations on a larger map and stuck thumbnail prints in (roughly!) the right place. After the school visits were over I compiled seven montages of the children’s photographs of each area we’d visited (see top of post) and uploaded them to the Know Your Place website where you can find them in the Community Layer. The students’ survey work really got them looking hard at things they would otherwise have passed by and all the teachers commented on the benefits of this activity and how it can have an impact across the curriculum. I hope what I’ve done through this and similar projects is to provide the participants with a tool that will ultimately enrich their daily lives – below are just a few of the things children in one class observed (their comments are transcribed from audio recording) that they hadn’t noticed before. The children were noticing and appreciating the finer details and the effort, and the beauty in a way; even a 1950s estate has great beauty and thought and consideration that’s gone into it. If you can open people’s eyes on a small scale to where they are, then the longer term goal is to help them broaden their horizons and their aspirations and to appreciate what’s around them in other contexts as well. The collaboration that’s been involved – those sorts of skills that are again beyond price – if you can collaborate, if you can listen, if you can show respect for your thoughts and feeling and for the thoughts and feelings of other people, you just learn to have more value for yourself, more value for others and more value for the environment …. That’s what we’re about…and it’s fun and enjoyable and all the children have engaged with it. The outcomes – the beautiful photographs, the montages, the compositions – they’re stunning, it’s just really good quality stuff. 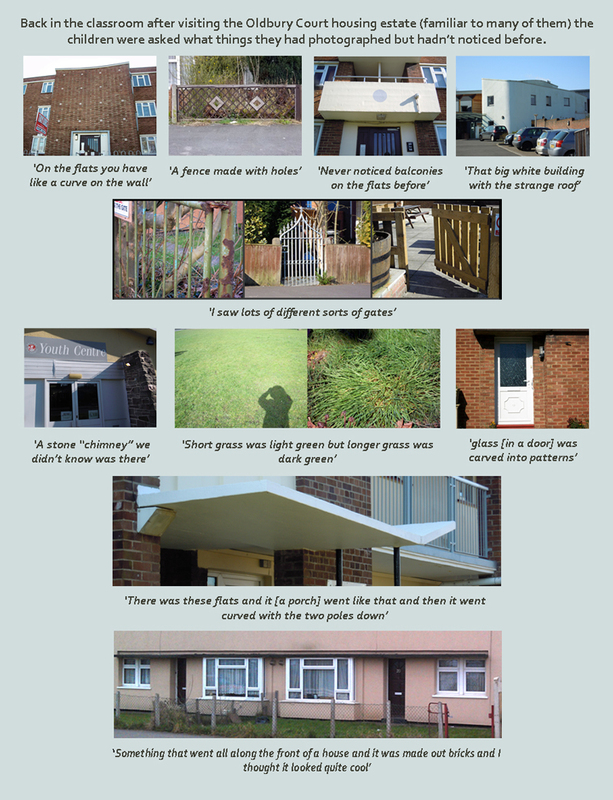 This entry was posted in Photography / arts workshops, Place, Urban projects, Ways of looking, Work and tagged architectural features, English Heritage, Local Journeys, maps, Oldbury Court Housing Estate Bristol. Bookmark the permalink.